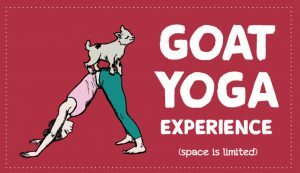 Centennial Farm will present a Goat Yoga Experience! Spectra Yoga teachers lead three beginner level yoga sessions, and the Fountain Valley Cloverdales 4-H Club will bring the baby goats! Visitors/spectators are welcome to watch the yoga sessions and tour Centennial Farm, which is open until 4 p.m., for free (without yoga). How much: $45 per yoga session. Session 3: 11 a.m.-12:15 p.m.
Support of OC Fair & Event Center provides year-round educational opportunities and helps fund community give-back programs. Copyright 32nd District Agricultural Association dba OC Fair & Event Center – All Rights Reserved.